The ZTZ-99A tank, known as China's king of land battle, will appear in the military parade at the Tian'anmen Square, Beijing, China, on the morning of September 3, 2015. 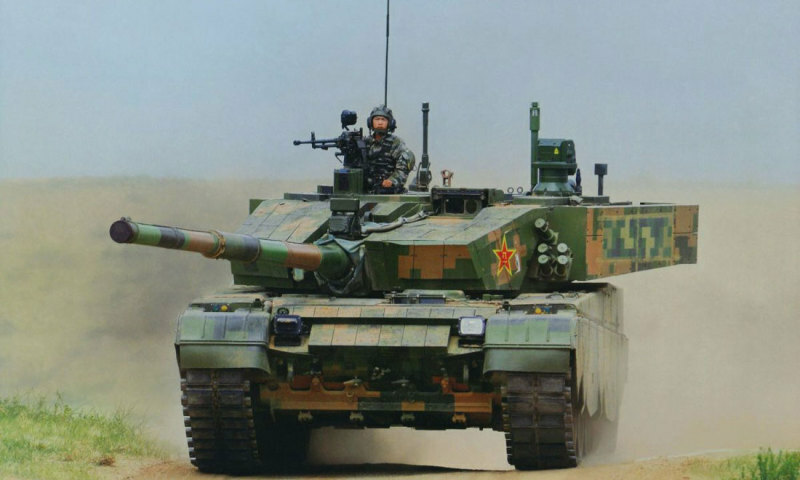 This will be the grand debut of the ZTZ-99A tank in China, but it made its name long before. During the "Peace Mission 2014" multilateral military exercises of the Shanghai Cooperation Organization (SCO), its maneuverability, power and speed wowed the world. 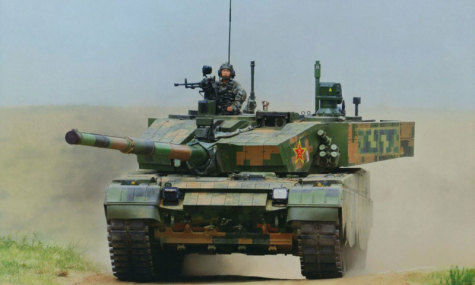 Mao Ming, chief expert of China North Industries Group Corporations and chief designer of ZTZ-99A tank, said in a recent interview that the ZTZ-99A is in a leading position in the world in terms of firepower, defense, maneuverability, and information technology. Before the ZTZ-99A is officially debuted, there are two kinds of assumptions about its main gun. One is that it uses the 140mm main battle tank (MBT) gun, and the other is that it uses the same 125mm main gun as the ZTZ-99 tank. Mao Ming said the ZTZ-99A tank eventually uses the 125mm main gun but it's not the same as the one used by the ZTZ-99 tank because it is able to launch more types of cannonballs with higher density. Compared with the ZTZ-99 tank, the ZTZ-99A tank's most conspicuous feature is that its main gun is equipped with a Dynamic Muzzle Reference System (DMRS). "The firing accuracy of the tank is directly affected by muzzle turbulence of its main gun." Mao Ming said that the Dynamic Muzzle Reference System can read muzzle turbulence and transmit the data to the computer to improve hitting rate. Compared with the ZTZ-96A tank that just participated in the Tank Biathlon in Russia, the ZTZ-99A tank is more accurate with no need for manual calibration when firing its main gun. The ZTZ-99A tank also features revolutionary improvements in its defense capability. Its turret is not only armed with the tougher new-generation explosive reactive armor (ERA), but also equipped with the new-type compound armor on the top. In addition, China's laser dazzler system makes the tank more powerful. In addition to these changes on the appearance, the application of information technology has resulted in invisible changes. Situations on the battlefield are constantly changing. For instance, when the tank commander sees a lot of targets, which one to hit first? Where should the tank go and at what speed? The firepower, defense capacity and maneuverability of the ZTZ-99A tank have been multiplied through information technology. "It is China's first information-based tank." Mao Ming said proudly that the ZTZ-99A tank lays the information-based foundation for the first-generation army equipment in China, not only realizing such functions as information sharing, coordinated attack and defense, status monitoring and system restructuring, but its software, components and parts are all independently developed. Moreover, the ZTZ-99A tank is able to monitor the system status and reconfigure the system. For instance, the equipment would automatically adjust to a lower level in case of failure, and report the need for fuel or ammunition replenishment to the backstage to ensure more accurate support. The ZTZ-99A tank is slightly taller than the ZTZ-99 tank but more than 30cm shorter than the 2.7m big tank used by the NATO. Since there is a 0.45m ground clearance, the chief designer's designing and arrangement have to be fitted within a less-than-two-meter-tall body. An excessive height would not only make the tank ponderous, but also increase the possibility of being discovered and attacked. However, the ZTZ-99A is more than 15 tons lighter than those used by NATO thanks to excellent height control, according to Mao Ming. Another revolutionary improvement of the ZTZ-99A tank is its considerably enhanced transmission system. At the Defense and Security Equipment International Exhibition in London in September 2014, tank was replaced by all kinds of mine resistant ambush protected (MRAP) vehicles, next-generation soldier combat systems and other equipment. Some European countries have given up tanks. People begin to wonder whether China's heavy-armor tanks will still be of any use. Mao Ming has thought about this for a long time. China upholds the independent foreign policy of peace and implements the strategic guideline of active national defense. It borders with 14 countries due to its vast territory, which leads to the complicated geo-strategic competition. Under the future background of integrated and united combat, the army remains the strategic backbone force for safeguarding national security, an important force in the joint operation, and the main force for ground battle. Safeguarding territorial security is the basic mission of the military, land control is the basic approach to achieve that, and armored mechanized troops represented by tanks are the most effective ground assault force for land control. "The role of tank isn't weakened. Instead, strong military powers in the world have all begun a new round of tank exploration and development." Mao Ming introduced that the development of ground assault equipment, of which tank is a typical example, is experiencing a new surge.